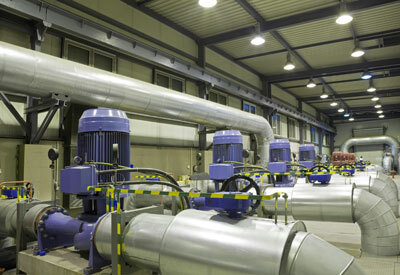 Industrial fans, pumps and air compressors use more than 50% of the total motor-related electricity used. According to the U.S. Department of Energy (DOE), industrial motor-system energy use could be reduced by 11 to 18% if all existing cost-effective technologies and practices for improved efficiency were implemented. As of October 1997, the Energy Policy Act (EPACT) required all motors sold in the U.S. to meet efficiency standards. In 2001 a new class of premium efficiency motors was designated, setting standards for new motors beyond those of EPACT. Although high efficiency motors have been available for years, they make up less than 10 percent of all industrial motors in current use. If your motors are not part of this 10 percent they could be using excess electricity—increasing your operating costs. See the links below to help calculate your motor operating costs, develop a policy for motor repair and replacement and develop strategies to reduce energy use by motors at your facility. The following resources, tools and case studies may help you move forward with optimizing your motors. DOE Office of Industrial Technologies (OIT):Best Practices for Motors, Pumps, and Fans. On this page, you will find BestPractices resources that are specific to motor systems. These include publications, software tools, and training information. MnTAP Source Article:Variable frequency drives (2004). VFDs on motors can enhance process operations, especially for flow control, and can efficiently cut energy demand for pumps and fans. Ohio Electric Motors, Inc. Online Motor Resource Center. Students, professors, and professionals can find informative and accurate information on beginner and expert electric motor topics. The U.S. DOE offers three software tools for evaluating motors and identifying opportunities to increase efficiency. Pepsi Bottling Group (2009). A team at the facility determined that shutting off the motors when they’re not needed in one production area saves $5,200 annually in energy costs. 3M [PDF 191KB]. 3M saves $823,000 annually on energy, maintenance and reduced steam and chilled water use as a result of an in-house motor system performance optimization project.